The FD-200B Baby Heart Sound Listening Tool is a Baby Heartbeat Listener. Listen to the sounds your baby makes - FD-200B is a Personal Sound Amplification Product that allows you to hear your baby's sounds like kicks, movement and heartbeats. Safe and non-invasive, FD-200B promotes bonding with your baby for both mommy and daddy. Or share your experience with your other family members. Record the sounds to your computer to listen to later when the baby is older - a timeless keepsake. Recorded sounds can also be shared via Social Media to Friends and Family. Or record Mommy's heartbeat to later use to soothe your new-born baby by playing the sounds back. (Recording cable not included) Package Includes: the FD-200B Heartbeat Listener, Lubricating Gel, Batteries and English user manual. Volume is adjustable. Uses 2 AA batteries (included). Compact, Easy to Use and Lightweight. Uses standard 3.5mm audio jacks so you can use with your own devices. Best when used after the 12th-16th week of pregnancy: a baby's heartbeat is detectable between 8 and 16 weeks only under ideal conditions. Each week, as the baby grows stronger, it will be easier to hear the heartbeat. We recommend liberal use of lubricating gel to reduce the static caused by moving the monitor around on the belly (gel is included). 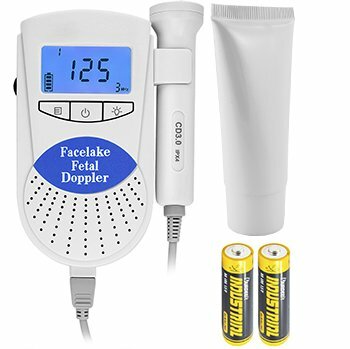 Note: The FD-200B device is a listening system to hear the sounds your baby makes and IS NOT a medical device and can not be used for diagnostic or medical purposes and is not to be used as a substitute for regular prenatal care by a licensed practitioner.